Famed jazz musician and former College professor Tony DeNicola could never be called one-note. DeNicola, who died Saturday, Sept. 2, 2006 on his 79th birthday, instead leaves a multi-tonal legacy of music, scholarship and friendship behind. 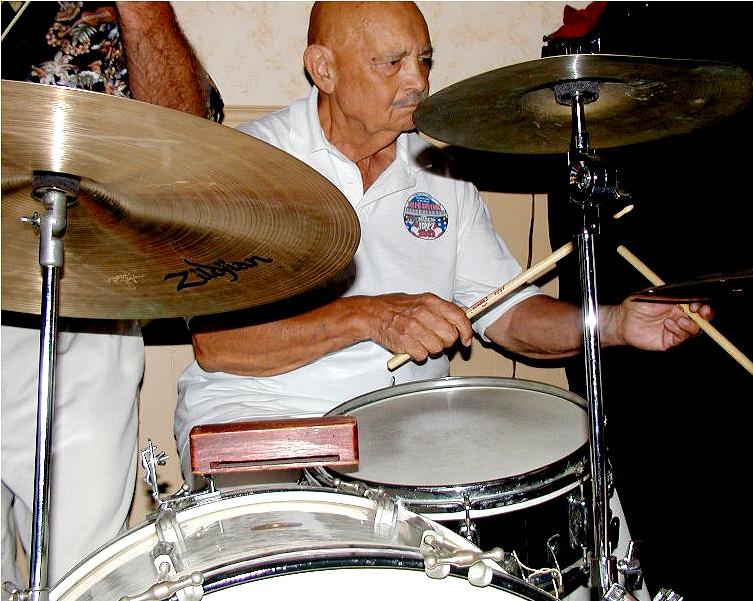 A longtime resident of Pennington, he not only made his mark on his community, but the world of jazz, where as a percussionist he played with some of the greats of the big band era, including Harry James, Kenny Davern, Clark Terry and Freddie Martin. He remained popular among fans until his death, which shocked many who knew nothing of his ill condition and cancer diagnosis. Perhaps even more impressive than his sterling reputation as a musician, which included his acceptance of New Jersey's first "Jazz Musician of the Year" award, was his status as a beloved professor here at the College. He taught for many years before retiring in 1992, having amassed a devoted following of grateful students. Keith Csolak, a former student, wrote in an online guestbook on the philly.com obituary page, "He is my mentor not only as a teacher but most importantly as a beautiful human being … I will never forget our times at (Trenton State)." According to former students, DeNicola was a true professional who never let his career success overshadow his inherent modesty. He sought to introduce students to real-world musical challenges and experiences. He often brought his own band to play with students in the Rathskeller, allowing his students to feel at ease playing with such seasoned professionals. "We would play with big bands at the College's student center on Monday nights, often with big names that Tony would bring down from New York to solo with us," former student Bob Gravener said in a Times of Trenton article. "It was a great learning experience." DeNicola also created what is the College's current Jazz Ensemble, devoting yet another chunk of his time to performing and instructing. Many other former students have nothing but praise for the man who helped them hone their musical prowess and find careers. Born in 1927, DeNicola was a lifelong lover of music. He played in his high school band, which was followed by a stint in the Korean War where he played in the U.S. Army band. Already considered a professional drummer of some esteem, he returned to the College - then Trenton State - to receive a master's degree in music. DeNicola got his big break when future game show host and singer Merv Griffin heard him in a Trenton jazz club. Griffin, a member of the Freddie Martin orchestra, was impressed by his drumming and convinced DeNicola to join the orchestra. He did and followed them out to Las Vegas, where he met and began his lifelong friendship and partnership with renowned trumpeter Harry James. While playing in James' band he met Kenny Davern, the leader of a popular jazz quartet, whom DeNicola came to play frequently with. With Davern's band, he traveled worldwide to places like Europe and Japan, as well as more local venues in New Jersey, New York and Philadelphia. "He became the guy I would call first no matter where we were performing and was on every recording I made during the past 10 years," Davern said in the Times article, noting that DeNicola was planning on joining the band for a small performance tour at the end of September. DeNicola enjoyed numerous friendships with many of his fellow musicians, often appearing as a guest drummer with them at various performances. A concert program for the Philharmonic Center for the Arts in Florida, where he played on occasion, said, "He is known and appreciated among other musicians for his steady and supportive time," one of the many compliments bestowed upon him by fellow jazz artists. "DeNicola's death, like that of all outstanding musicians, leaves a void that is unique, one that can be replaced but never really duplicated," William Klug, professor of biology, said. "You cannot travel anywhere in the world of jazz musicians and mention that you know Tony without their immediate recognition. And we, at this institution, were lucky enough to have him with us for almost two decades." Tony DiNicola (drums) has worked and recorded with such jazz luminaries as Harry James, Ruby Braff, Bob Haggart, Charlie Ventura and Kenny Davern. I was private student of Mr DeNicola. I was going to him at his house for lessons for 6 years. I found as a Drummer and learning from Tony my early years from 13 to 17 those were most I ever learned. My Last name is Brian Calla. What I remember most was he called me supercalifragilisticexpialidocious... "Calla" some how got to that not sure how. But thinking back on it is what I remember. Nothing ever dies.. music can never be stopped because inside its always there. A great guy and a great player. It's been a long time overdue, but I would just like to add my appreciation and thanks to a great and warm human whom I have been fortunate to spend a considerable amount of my formative years with. I was just 7 years old when I bean my formal studies with Tony, (whom I referred to as my music dad). I was so young and loved my times sharing Saturday mornings with him. I was his first student at the bright and early time of 8 00 for over a decade. I will never forget 883 1419 and 112 darrell lane........it as well as this great man are forever imbedded in my being. He was so patient with me as I brought him the likes of Highway star and Kansas, which we would discuss before the real work of Fred Albright and 4 Way Coordination. P.S .......I will never forget "Rudimantal Rascal"
I was quite saddened some years ago when a received a newsletter from TCNJ (Formerly Trenton State College) to see that Tony had passed away. I was a student at TSC from 1984 until my graduation in 1988. Tony was one of the reasons I chose to go to TSC in the first place. Even though I changed my major from music to commuication after my first year, I continued to play with Tony and the other music students in the percussion ensemble and take music classes. Tony was one of the finest human beings I have ever met. He always seemed to be happy, and always had a kind word to say. He was a great musician, great professor, but most importantly a great human being. He will be remembered and sorely missed not only by me, but every life he has touched. I know that somewhere out there, Tony is still tapping away!!! I studied at Trenton State College in 1992 and Tony was my percussion professor! Not a day goes by that I don't remember the one-on-one instruction and time I had with him! He was one of a kind, and as an 18 year old kid, I had no idea at the time I was studying under one of the best drummers this world would ever know! What a wonderful person and teacher Tony was. I enjoyed every moment I spent studying with him, and believe me, he broadened my drumming horizons forever. A monster player, too, by the way. First class. Rest easy, brother. I don't know about that Korean War citation -- Tony and I were very close buddies in the Army Air Force in 1946. We were in Special Services together, and then he went into the Army Band. on the base in Wichita Falls, Texas. He was playing clubs in New York by the time of the Korean War. A favorite memory is of Tony and Jimmie Fair ( of the Cab Calloway band) rehearsing a drum duet in the office -- No sticks available, Tony was playing with rulers, one broken. And it was perfect. I just googled Tony and read here of his passing. I was a student of his, probably the worst and least motivated but I loved drums and thought he was tops. I was always proud even to be a lousy student of his. I learned little of music but his influence has always been with me. Hello, I am Darrell Soltesz a former student of the late, great Tony DiNicola. I honed my be-bop chops with Tony when I was playing in Trenton rock bands in the 80's wanting to perfect my jazz chops which helped me make my way working with members of Frank Sinatra's and Lionel Hamptons band with the swing/jazz bands during the 80's & 90's!!! Tony Thanks For The Mentoring Of A Lifetime!! !